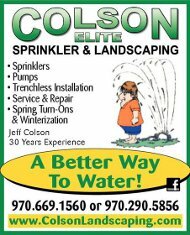 Colson Elite Sprinkler & Landscaping, Inc.
Colson Sprinkler & Landscaping provides landscaping installation services of all kinds. We specialize in installing sprinkler systems in established lawns. We do complete landscapes from the dirt up. Soil preparation either with a Bobcat or rototiller to work in compost and then sprinkler system, then sod. We do design & installation of planting/shrub beds with decorative rock or wood mulch, rock gardens, water falls, ponds, dry stream beds, xeriscaping, decorative boulders, trees, everything needed to make a yard gorgeous. 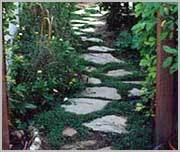 We can totally redo an old yard into new. Rip out the old grass, do a soil prep and install new plant beds, sprinkler, sod. We service all types sprinkler systems. We install sumpumps in basements, and submersible pumps into creeks, ponds, or wells to irrigate landscaping. Sprinkler systems can include drip systems & faucets for the shrub beds & gardens. We install Iowa faucets and livestock waterers. Sprinkler systems can include rain gauges and automatic controllers with backup programs and multiple run times so starting new sod is a breeze. They are relatively easy to program similar to an alarm clock. Our sprinkler systems come with a Free Winterization and a Free Spring Start Up. We provide Free written instructions and a Trouble Shooting Guide. Our sprinkler customers are well taken care of. Our company was founded in 1996! We are a family company with over 50 years experience in the industry.